Maria Calegari, acclaimed former Principal Dancer for New York City Ballet, performed on world stages. She is now a valued instructor of professional companies abroad and in the U.S., and teaches all levels and all ages of nonprofessionals. Sometimes, the youngest students in her beginnerâ€™s classes are the same age Maria was when she started ballet: 3Â½, with a teacher named Jeanette DuPons, in Bayside, Queens, N.Y.
Maria continued at Ballet Academy in Forest Hills, N.Y., with Florence and Victor Reilley, who prepared her for an audition at the School of American Ballet, the premier training ground, associated with New York City Ballet. At age 14, Maria received a full scholarship at SAB and free tuition at the elite, private Professional Childrenâ€™s School. When she was only 17, in 1974, Maria was personally chosen by the Company Director and world-famous Choreographer George Balanchine to join the New York City Ballet. She was promoted to Soloist in 1981 and Principal Dancer in 1983. Maria worked extensively with Balanchine for a decade and has performed more than 40 soloist roles in his repertoire at Lincoln Center. She has had many favorite ballets â€” "Serenade", "Agon", "Apollo", "Jewels", "Mozartiana", "Swan Lake", "Divertimento #15", "Violin Concerto" and "Lebeslieder Waltzer", and "Nutcracker". She also worked closely with NYCB Associate Artistic Director and renowned Choreographer Jerome Robbins, dancing in most of his repertoire, including "Dances at a Gathering", "In the Night" and "Afternoon of a Faun", and originating roles in many new works, such as "Glass Pieces" and "Antique Epigraphs". In collaborative work with Robbins and Twyla Tharp, the Brahms-Handel, Maria appeared as the ballerina for the Tharp section. Ms. Calegari has often appeared on public television. She danced the role of Titania in Balanchine's "A Midsummer's Night's Dream" on "Live From Lincoln Center." Her dancing can be viewed at the Library of Performing Arts Dance Collection at Lincoln Center. Maria began her teaching career with students of all ages and professional dancers after leaving NYCB in 1994. She served as Artist-in Residence at the Richmond Center for Dance and as an Associate Professor of Dance at SUNY Purchase in New York. She had her own school, The Maria Calegari School of Ballet, in New Milford, CT, from 2002-2004. She also continued to dance after leaving NYCB, appearing in "Suzanne Farrell Stages Balanchine", at the Kennedy Center in 1995, and with the Richmond Ballet in 1997-1998. Her final dance appearance was in 2000, in Balanchine's solo "Pavane" to music of Ravel, with Ben Huyâ€™s touring group in Germany. Her work as a "repetiteur" for the George Balanchine Trust began in 1996 and for the Robbins Rights Trust in 2003. A repetiteur helps preserve the works of choreographic masters by teaching and staging them precisely as originally intended to companies that wish to perform them. Maria has taught and staged such ballets for the Royal Ballet (London), San Francisco Ballet, Miami City Ballet, Ballet West, Boston Ballet, and Leipzig Ballet, among others. She often travels with her husband, Bart Cook, also a former Principal Dancer with NYCB and repetiteur for both Trusts. They visit most of the major ballet companies throughout the world. For The State Ballet of Georgia, whose Artistic Director is now ballerina Nina Ananiashvili, they have taught and set more than 10 Balanchine ballets, including "Serenade", "Bugaku" and "Mozartiana", during the 2005-2007 seasons. 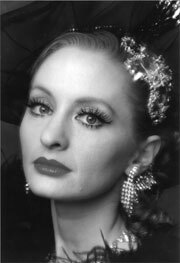 Ms. Calegari staged the Diamonds section of Balanchine's "Jewels" at the Royal Ballet in November 2007. The overall production won the prestigious Laurence Olivier Award for Best New Production. Mr. Cook and Ms. Calegari's 2003 staging of "Ballet Imperial" for the Tchaikovsky Perm State Ballet in Perm, Russia, won the Russian Golden Mask Award. Maria is an avid watercolor artist. She serves on the Advisory Committee of Arts on the Lake, in Kent, N.Y. She has written articles for "The Beacon" magazine on George Balanchine's life and career. She is listed in "Whoâ€™s Who in America". Reviews from her dance career and recent stagings can be accessed on the web. Maria Calegari resides in Putnam County, New York, with her husband, Bart Cook, and their beloved cats. Their love of children and their environs inspired Maria and Bart to launch a quality ballet program in their community in 2009.